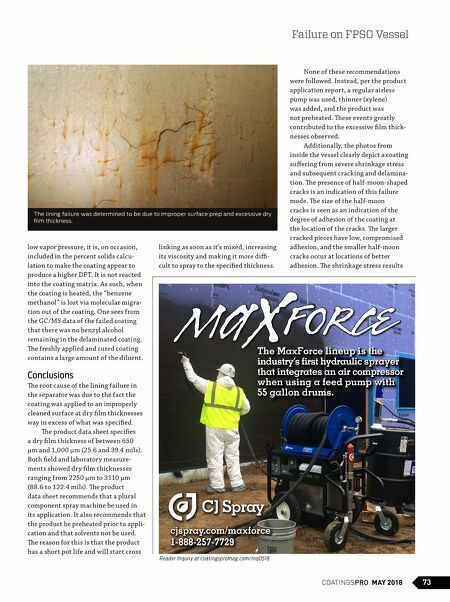 72 MAY 2018 COATINGSPROMAG.COM experienced the hot service tempera- tures for an extended period of time, and the freshly applied phenolic epoxy was about one month old and subjected only to curing for a few weeks. To determine what was being lost from the coating matrix producing the shrinkage stress, samples of the recently applied coating were obtained from the coating manufacturer. e manufacturer's product data sheet states the percent solids of the coating is 98 percent after loss of solvents at application. e photos depict an exces- sive shrinkage loss that appears greater than the 2 percent available stated in the product literature. To evaluate the percent of actual weight loss, a sample of the coating was chipped from the recently applied and cured coating, weighed, carefully heated, and reweighed. is crude weight loss test indicated about 5 percent additional weight loss. e small chip was heated in a test tube with a paper towel cooling band saturated with cold water above the area of the coating. Some higher boiling materials escaped and condensed on the wall of the test tube. A large 10-inch-long (25.4 cm) delaminated coating chip was measured for dry film thickness (DFT). e thickness along the fracture edge ranged from 2.25 mm (0.09 in.) at one location to 3.11 mm (0.12 in.) 6 inches (15.2 cm) away on the same chip. e manufacturer's product data sheet says the "typical " DFT should be 500–1000 microns (19.7‒39.4 mils) and applied over an abrasive blast cleaned surface to a standard of Sa 3 (NACE No. 1/SSPC-SP-5: W hite Metal Blast Cleaning). 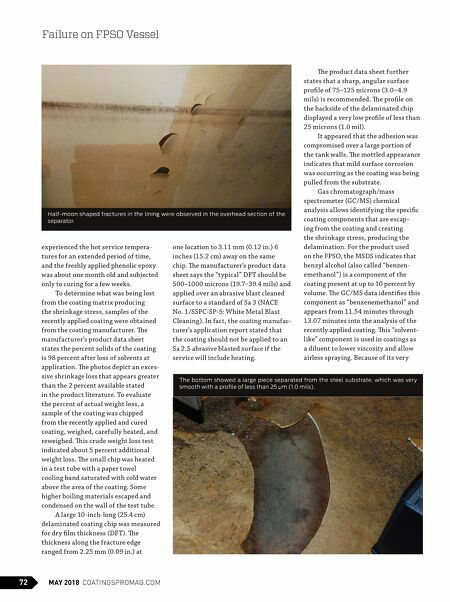 In fact, the coating manufac- turer's application report stated that the coating should not be applied to an Sa 2.5 abrasive blasted surface if the service will include heating. e product data sheet further states that a sharp, angular surface profile of 75‒125 microns (3.0‒4.9 mils) is recommended. e profile on the backside of the delaminated chip displayed a very low profile of less than 25 microns (1.0 mil). It appeared that the adhesion was compromised over a large portion of the tank walls. e mottled appearance indicates that mild surface corrosion was occurring as the coating was being pulled from the substrate. Gas chromatograph/mass spectrometer (GC/MS) chemical analysis allows identifying the specific coating components that are escap- ing from the coating and creating the shrinkage stress, producing the delamination. For the product used on the FPSO, the MSDS indicates that benzyl alcohol (also called " benzen- emethanol ") is a component of the coating present at up to 10 percent by volume. e GC/MS data identifies this component as " benzenemethanol " and appears from 11.54 minutes through 13.07 minutes into the analysis of the recently applied coating. is "solvent- like" component is used in coatings as a diluent to lower viscosity and allow airless spraying. Because of its very Failure on FPSO Vessel Half-moon shaped fractures in the lining were observed in the overhead section of the separator. The bottom showed a large piece separated from the steel substrate, which was very smooth with a profile of less than 25 µm (1.0 mils).